Decoustics Ceilencio Ceiling System can be customized for virtually any geometric pattern, from diamonds to pentagons. The system consists of a concealed extruded aluminum grid and panels, with custom individualized "butterfly" clips. A torsion spring mechanism enables the panels to be completely downward accessible. 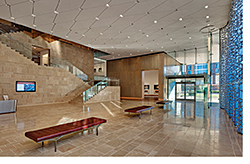 Integrates with many of the company's acoustic panel offerings.